This 10-year-old chance C. japonica seedling first bloomed in 1951. It was originated and registered by Mrs. H. Turner Brice, Valdosta, Georgia. 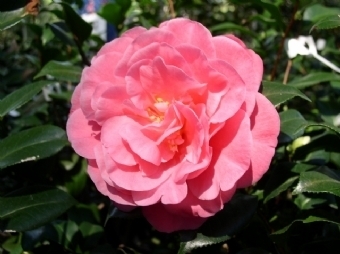 Bloom: The large semi-double to loose peony bloom is coral rose with slightly curved petals and a few upright petals and 6-12 petaloids/rabbit ears. The blooms open wide. Received the John Illges Medal from the American Camellia Society in 1963. Plant: Average growth rate on a compact, upright plant. Leaf: Dark green leaves, 2.9" x 1.5".